Wii Transfer for Mac can share your movies, music, and pictures directly to your Nintendo Wii using the Internet Channel. Copy Miis from your Wii back to your Mac and save them as images. Browse iTunes playlists and iPhoto albums on your television. Convert your movies to a format the Wii understands, streaming directly from your Mac. 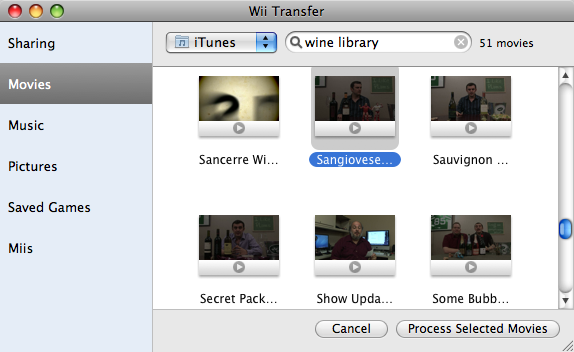 Wii Transfer for Mac can even manage saved game backups copied to an SD card. share your movies, music, and pictures to your Nintendo Wii. * Copy Miis to your Mac and save them as JPEG images. * Works with most common movie formats, including MOV, AVI, MPEG4, H.264, DivX, and more. * Restrict browsing to specific iTunes playlists or iPhoto albums. * Works with MP3s or unprotected AAC files, including iTunes Plus and Amazon MP3. * Drag-and-drop movie conversion for streaming. * Set background music for picture slideshows. * Browse Safari and Firefox bookmarks on your Wii. * iTunes playlist support and browsing by album. Even search. * Show album cover artwork in the music sharing interface. * Browse and convert iTunes video podcasts from within Wii Transfer. * AppleScript support for automated conversions. * Backup saved game files from SD card to your Mac automatically. Qweas is providing links to Wii Transfer for Mac 2.7.2 as a courtesy, and makes no representations regarding Wii Transfer for Mac or any other applications or any information related thereto. Any questions, complaints or claims regarding this application Wii Transfer for Mac 2.7.2 must be directed to the appropriate software vendor. You may click the publisher link of Wii Transfer for Mac on the top of this page to get more details about the vendor.